We are very fortunate. On Monday our city was hit by what may be the worst natural disaster it's ever seen, and our home was barely touched. A skylight above the building's stairwell was damaged, but I believe that was it. 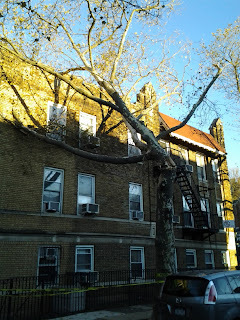 Our trees stayed up through the pounding wind, and, despite the many flickers, our power stayed on. Our neighborhood, for the most part, was spared. 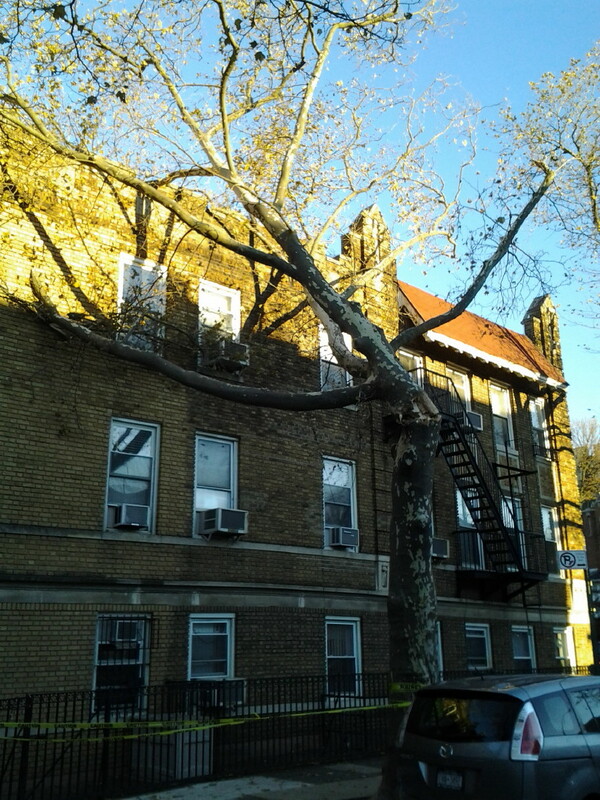 The tree to the right is the worst damage I've seen on the streets, though nearby Prospect Park was hit hard (some 300 trees gone). No subway service for several days and the lack of gasoline have made our lives a little inconvenient, but it's nothing compared to the grief many in our city are experiencing right now. So many have lost their homes or loved ones, and hundreds of thousands are braving the cold November nights without power. As many in our neighborhood have been saying, we're living in a bubble right now. Outside of the minor hardships, life here is basically back to normal. We even had trick-or-treating on Wednesday as if nothing happened. Yet, in Breezy Point, Queens, a mere twenty-minute drive from here, there are people digging through the charred remains of 100+ homes that were incinerated. Some have lost everything and are trying to figure out just how to make it through the week. When those homes burned Monday night, we could smell the smoke. That's how close we are to the devastation, and yet, everything here is fine. We have some friends who own a home in Breezy Point, but they say it wasn't involved in the fire. Some of our other friends have lost power, but, for the most part, they are all okay. Thank God. New York City is coming back, too. Subway lines are now starting to work again (in fact, today we took our first train since the storm), and lower Manhattan, which had been in the dark last week, is glowing again. Best of all, this community is coming together to help those in need. On Facebook, Twitter, and online discussion groups, people are asking how they can help. Some volunteer stations have been overwhelmed by donations. Those who have gas in their cars are driving to the troubled areas to deliver food, clothing, and other needed items, such as batteries and flashlights. Go to a supermarket, as I did yesterday, and you'll see people walking down the aisles, figuring out what to buy for those in need. I saw a mother instruct her sons to look for economical supplies so they can get the most out of the money they raised to help. There's no doubt that New York will recover from this, and that's because the people here care for each other. We love our neighbors. You can also text the word REDCROSS to 90999 to make a $10 donation. Some of the most sought-after items cost less than $10, so even a small donation will help tremendously. Together, we will recover. Thanks so much for your help. Towards the end of our busy summer, my four-year-old son Kyle met up with one of his friends at the playground. Already too cool for Dad, Kyle immediately ran off once we arrived, leaving me alone with his one-year-old brother Adam and his friend's parents. After a brief exchange of pleasantries ("Nice weather, huh?" "What do you do for a living?" "How are your child's bowel movements?") the friend's mother said, "I'm so glad the summer's over. I can't imagine watching our kid all the time. My mind is turning to mush." I told her I agreed, as I wiped away some of the brain that has been oozing out of my ears for the past four years. Yes, it's not easy watching over the little monsters, and with both of them home almost all summer, my mind was very much pureed by September. I often felt out-numbered, with each kid shooting me with a barrage of demands. Adam would want me to walk him around the apartment, while Kyle would want me to sit and play Legos with him. Kyle would ask questions over and over again, while a tired, hungry, or needy Adam would just scream over and over again. Adam would grab my legs and pull me in one direction, while a hyper Kyle would grab my arms and pull me in another direction. As soon as I'd figure out how to calm things down, something would happen - usually Kyle taking a toy from Adam, or tackling him - and it would all erupt again. So all day long I'd deal with two opposing forces, demanding my attention but taking me for granted, contradicting themselves and neither making much sense. Many times I'd find myself just begging them, for the love God, please stop and be quiet. It was like watching the presidential campaign. Fortunately, there were some quiet moments, too, mostly while Adam napped. But that's when Kyle asked to play his new favorite game: the mental mush-maker known as Candy Land. For those of you unfamiliar with this beloved children's game, here's how you play it: You pick a card. You move. You pick a card. You move. You pick a card. You move. Over and over again. That's it. No skill needed whatsoever. I must have played Candy Land about a hundred million times over the summer, and yet today I am no better than I was when I first played as a young child decades ago. The cards reveal colored squares or candy images that direct you along a multi-colored road to the game-winning Candy Castle, leading you past the Ice Cream Slopes, the Gummy Hills, the Licorice Lagoon, the Chocolate Mountain, and Tooth Decay Volcano. The game pieces are shaped like gingerbread men, and come in four different colors. Kyle likes to switch up the colors each game, providing the only mental stimulation: trying to remember that you're the green piece this time, and not the red one you had in the last game. Often that's how I lose. I've been trying to figure out the ultimate Candy Land strategy, but there seems to be none. Even counting cards doesn't work. That action lets you know when you're going to get zinged by a "bad" card, but doesn't help you prevent it. Yes, there are "bad" cards to choose - say, if you're close to the end of the game and you draw a card with a picture of a cupcake, you have to move your piece all the way back to the cupcake square which is near the beginning of the game. Cupcakes are, as everybody knows, pure evil. Tragically, you can't trade the card away, and you can't hold it to spring on your opponent later. If you identify the card early, you could try letting your four-year-old take two turns in a row (out of "kindness") and stick it to him that way. Sadly, though, these four-year-olds catch on quickly. So I give up and just sit there with Kyle, putting my brain on auto-pilot, flipping cards, moving pieces, and listening to the constant nudge of "It's your turn, Daddy." "Yellow card, Mr. Bond," said the dealer. Without taking his eyes off the villain across the table, Dr. Necco, Bond slid his blue gingerbread man to the yellow square, just four spots from the game-ending Candy Castle. Bond did not need to look at the board. He's James Bond, after all, and he knows his Candy Land. The crowd surrounding the players watched intently. There was not a sound in the room, except for the crush of licorice between Dr. Necco's teeth. He nodded at the dealer, who drew a cupcake card. The audience gasped. Dr. Necco slid his red piece all the way back to the cupcake square near the start of the game. "Time to give up candy, Dr. Necco," said Bond. "I'd say your sugar high is about to crash." But just then one of Dr. Necco's thugs jumped up from behind and put a dagger under Bond's chin. Dr. Necco laughed. "You thought you had me beat, didn't you Mr. Bond?," he said. "Looks like you're about to get a cavity - in your neck. Sorry you won't be able to win. You see I am the true king of the Candy Castle!" Bond smirked, and then jerked his head back, knocking out the goon. He grabbed the dagger just as Dr. Necco rose from the table and reached for his gun. Bond flung the knife at Dr. Necco's hand, slicing it and causing him to drop the weapon. Some blood landed on the board and deck of cards. "Looks like you drew a red card," said Bond to Necco. "And you, Mr. Bond, have a purple card!" said the dealer. "You win!" Nope... the game still seems boring to me. With Kyle back at school, we don't play Candy Land as often as we did during the summer. Strangely, I do miss the game a little bit. Maybe I just enjoy seeing Kyle get excited over it. I know I will miss these moments someday, even if I have trouble staying awake through them. Now that I do play the game less, I won't go as far as to say that my mind has recovered; I believe some of the damage might be permanent. Yet, after a month or so of a quieter apartment, with silence during Adam's naps, I can do simple things again, like think in complete sentences. It's a good start, and maybe I'll be able to keep it going... at least until Adam hits the terrible twos. Sunday was Adam's first time flying on an actual airplane (he's done the "Super Adam" flight with Daddy many times - and has crashed only a few). That meant it was our first time flying as a family of four. We were heading to Tampa, Florida, to see Jennifer's grandmother and introduce her to her great-grandson. Naturally we were a bit anxious. There were bags to pack! We needed flight, hotel and car reservations! We needed books, toys, and a portable DVD player for the noisy flight! We also needed directions to the nearest liquor store for after the flight. Yes, traveling with two young kids, ages four and one, is not an easy task by any means. Most times we drive, but driving to Florida didn't seem to make sense, considering Jennifer didn't have enough vacation time for the hours on the road and the necessary lobotomy to cure our headaches after the trip. So this Sunday morning, we put our diaper bag, 50-pound suitcase, carry-on suitcase, carry-on duffel bag, toy bag, snack bag and stroller into the car and took off for the airport. A few minutes later we returned home to pick up the kids. We arrived at the airport before 9:00, and were in the ticketing line a short time later for our 10:45 a.m. flight. We thought we had given ourselves enough time, but we were flying United Airlines out of Newark Liberty International Airport, whose motto is "Where do you think YOU'RE goin'? Ha! Not today, pal." The crowds at ticketing and baggage drop-off were larger than those for a rock concert. United's employees, to their credit, moved us towards a shorter line because we have two young children, but even so we waited about 45 minutes before we could touch a computer screen and drop off our bags. The computers weren't working properly, either, and a fast-moving employee kept racing back and forth from one computer to another, helping customers through the problems. After that, we walked to security and waited another half-hour in line as security guards let people in wheelchairs in ahead of us. Don't get me wrong: I have no problem with that. But every person in a wheelchair seemed to have ten family members with him or her, and all of them were let through, too. So we waited and waited, and nobody helped rush us through the line, even though the boarding of our plane had begun. Then, during the security check, some of our stuff was pulled aside to be scanned, including Adam's bottle. Turns out our baby closely resembles one of the FBI's most wanted and the security guards wanted to be sure he wasn't a threat. Then came the sprint. Because our gate was the farthest one away from security, we had to race around the winding hallways, trampling over those who were enjoying the moving sidewalks as if they're an amusement park ride. Kyle was amazing, reaching near-Olympic speeds. We darted past other gates, which I'm certain are not real but are just placeholders so that people like us don't get to sit and enjoy the airport (out of fear that we might be able to smell Newark). When we arrived at the end of the hall, technically in Pennsylvania, we realized that our gate was DOWNSTAIRS. Using my newfound adrenaline, I flung the suitcases down, then Jennifer, then the children, and then slid down the banister to our gate. It was 10:40, five minutes before departure. We had made it! "Sorry - the gate's closed," said the woman at the podium. That's when I lost it. "WHAT DO YOU MEAN THE GATE'S CLOSED?!?" I shouted. Everyone looked at me. "IT CAN'T BE CLOSED! WE HAVE TO GET ON THAT FLIGHT!! WE HAVE TWO CHILDREN!!!!" The children were doing their best to not be seen... they were a little surprised by their dad's reaction. "Sorry, we gave away your seats. You can talk with customer service," said the woman, who then gave a sinister laugh. I hollered again about the children, as if that would suddenly make them realize we had two kids and, out of sympathy or fear that they'd be stuck with all the screaming and crying, would let us on the plane. No such luck. The woman again directed me to United Airlines' customer service and, giving up, I darted there. It's a good thing I ran, too, because a line of about 200 people formed after I arrived. Apparently this sort of thing happens often with United Airlines. The two people at the customer service desk were outnumbered five-to-one by empty chairs. After waiting about 20 minutes, one United representative very kindly told me that the rest of the flights to Tampa that day were completely booked. I was devastated. But then, by some miracle, the rep discovered there was an early afternoon flight to Orlando with three empty seats. I took those, and an hour and a half later were were finally on a plane to Florida. 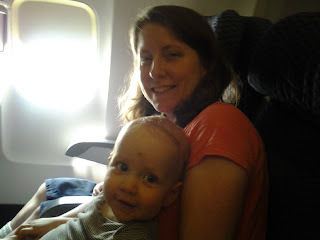 Adam cried and screamed through much of his first flight. Fortunately for us, this was a flight to Orlando, so many of the passengers were sympathetic parents. Nobody tried to kick us off the plane, which is a good thing, since they would have had to use the jaws of life to get me out of that seat. Relief settled in once we landed and began the hour-and-a-half trek to Tampa. As we started our journey, I was also relieved that our kids are ages four and one, and unaware that Orlando is the home of He Who Must Not Be Named. It is also home to Harry Potter and Voldemort, and I'm glad the kids don't know them, either. We arrived at Tampa at 8:30 p.m., about 12 hours after leaving our home. It might have been faster to drive down. The trip was certainly worth the hassle, and we had a wonderful time with Jennifer's grandmother and at our hotel in Tampa. Kyle would have been happy just staying in the pool all day, and we came close to doing that. The return home was less eventful, too. We flew United back from friendly Tampa International Airport, whose motto is, "Did you miss your flight? Don't worry honey - I'll call the pilot and he'll come back to pick you up." Adam also slept through the flight. That was exactly what we needed. We certainly have more plans to travel this year, but none involve flying, especially not from Newark. I'm very grateful for that. I recently read a news article saying that Sesame Street songs were being used on detainees at Guantamo Bay, Cuba. I'm not kidding. Apparently blasting Ernie's ode to his rubber duckie is more effective at wearing down suspected terrorists than other established forms of torture, such as waterboarding or the waiting room at the DMV. Of course, news of musical torture is making some people furious. The music industry has demanded that the government stop weaponizing their jingles. Human rights groups are protesting, while parents of young children are saying, "Is that the best you've got? You should spend a week at our place." Kyle loves Sesame Street. He watches it every day. More specifically, he watches the SAME EPISODE every day, thanks to the power of Netflix instant (and the dim-witted dad who introduced him to it). He does this for weeks at a time, then moves on to another episode and watches that one over and over again. I can't tell you how many times I've seen Elmo, Zoe, and Telly nearly fight to the death over who has the best pet. I've also watched, time and time again, the episode in which Natalie Portman convinces Big Bird that she can run Hooper's Store by singing a song about change and teaching a hyperactive neurotic elephant how to make an omelet. Then there's the episode Kyle's watching now, a retelling of "The Sword in the Stone" featuring Baby Bear, who has a voice that only a deaf mother can love. It's enough to drive a parent crazy sometimes. I suppose I could get out of this cycle and just force Kyle to watch the next episode, but I don't because I believe it's about Elmo going to the DMV. Fortunately, I have not suffered through repetitive children's music like many parents have... not yet, at least. We just don't have it playing in our home. I don't know if I deliberately meant for this to happen. I do know I was traumatized years ago, when we visited my young niece and watched Barney and Friends. The episode featured one of her favorite songs at the time, "Fruit Salad Yummy Yummy." If you need to know what I'm talking about, go ahead and look it up on YouTube - there's no way I will subject you to that myself. I swore then that I would never have that song in my home. Yet I don't think I intended to keep all children's music away. I just never attempted to listen to it. As a stay-at-home dad, my own music has been a source of sanity, and the kids usually enjoy it. In fact, Kyle has adopted some of our songs as his favorites, and now he likes hearing those songs over and over again. These days his two favorites are, in his words, "To-nah-nah-nah, We are Yun" and "Zoobie Zoobie Zoobie." The recording industry prefers to call the first song "We are Young," and it's by a group called Fun. It's a great song that came out this year, and I enjoy hearing it each day with Kyle, even if it makes a passing comment about the singer's friends "getting higher than the Empire State." Big deal - they could be on swings, right? The other song is "Zou Bisou Bisou," a French tune sung by Don Draper's new wife Megan on the season premiere of AMC's Mad Men. From what I understand, the song's lyrics are harmless; loosely translated, they're a cooking recipe for frog legs. The song doesn't exactly fit in my classic rock collection, but Jennifer and I are fans of the show and thought it would be funny to hear the song from time to time in shuffle mode. But then our almost-four-year-old started bouncing to it, and now he wants to hear it nearly every day. Even our almost-one-year-old, Adam, shakes his arms to the beat. Jennifer and I do get a kick out of watching them, though it's still a little strange when you consider how we first heard this song (click here). Kyle has not seen this clip, and I have no plans to show it to him. To him, Mad Men is about a bunch of guys in suits and fedoras who look at pictures of bears and honey, determining what emotions they bring about (and, yes, one picture makes them "mad"). This impression, of course, is from Sesame Street. I doubt I will introduce children's music in our home. It's too much of a risk. Don't get me wrong - there's a lot of good children's music out there. I often enjoy hearing it now and then. But "now and then" never happens in a young child's home. If the kids ever fell in love with "Fruit Salad Yummy Yummy," we'd have to play it every day, sometimes several times a day. Now that would be torture.